Minimalism is a visual concept that never goes out of style. It has been around for 60 years and it’s still relevant today. 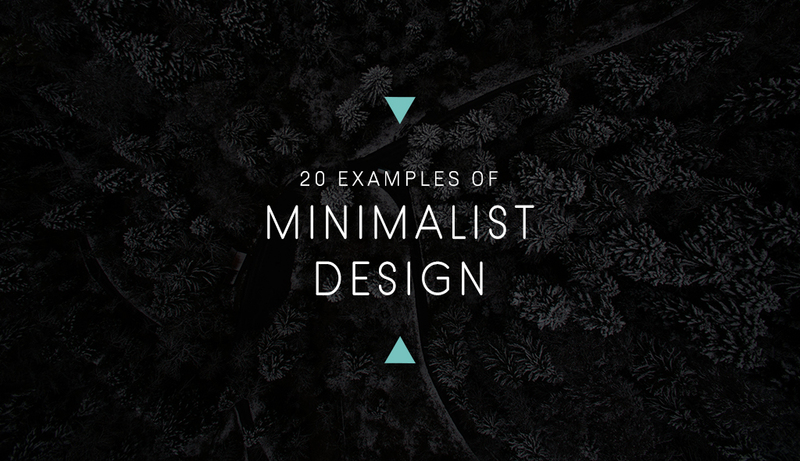 The main idea in minimalist design is to say more by showing less. Minimalist design is clean, crisp and timeless. Unnecessary objects and flourishes are left on the drawing board. Only the absolutely necessary is included to get the message across. Most minimalist designs include a lot of white or empty space. Even though white is the color of choice for most minimalist design, that doesn’t mean that others colors can’t also be used. White space can be replaced with black or blue space, as long as the other elements are minimal. Minimalism began as a movement that ultimately influenced all types of art and design. Minimalism affected not only the fine arts and graphic design fields but also fashion, architecture, interior design and more. Nowadays, minimalism is quite evident in web design and branding schemes. Let’s look at some examples of contemporary minimalist graphic design to inspire your own creations. At the end, we will take a quick look at some historic minimalist art and design posters to further fuel your creativity. A company's visual identity incorporates all aspects of its brand, including the logo, packaging, business cards and marketing materials. Designers can take a minimalist approach for all these components of a brand's image. For those who think a minimalist approach may lack energy and dynamism, a successful minimalist brand image can become very memorable for potential clients. 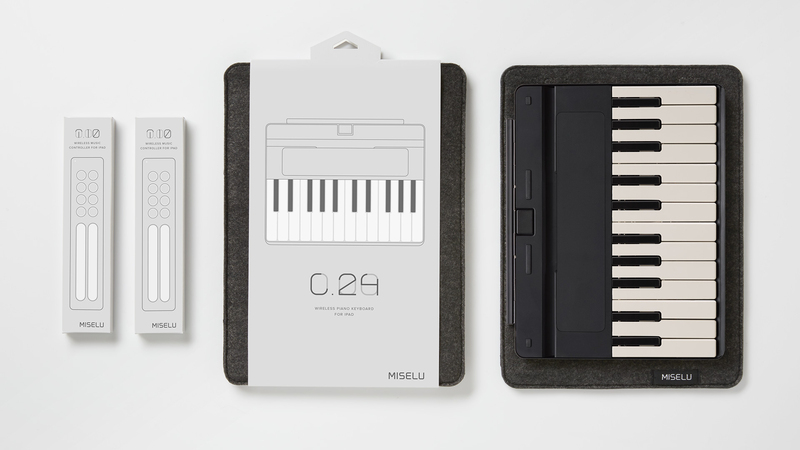 Take, for example, Miselu, a San Francisco startup that created an innovative iPad piano keyboard for musicians on the go. 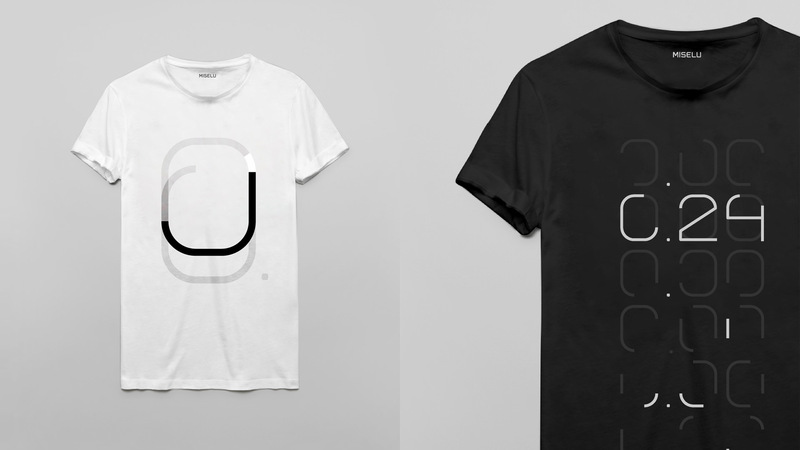 The creative brains behind the minimalist Miselu brand is Character, a design and branding agency in San Francisco. 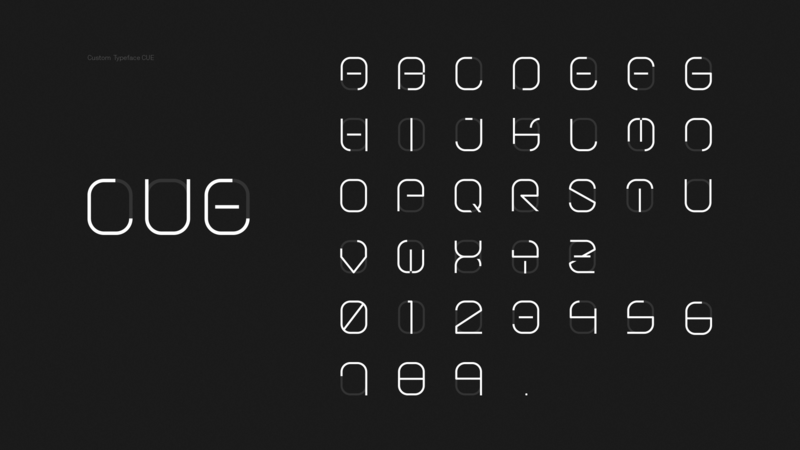 We think Miselu is a perfect example of how minimalist design can be creative and visually appealing. 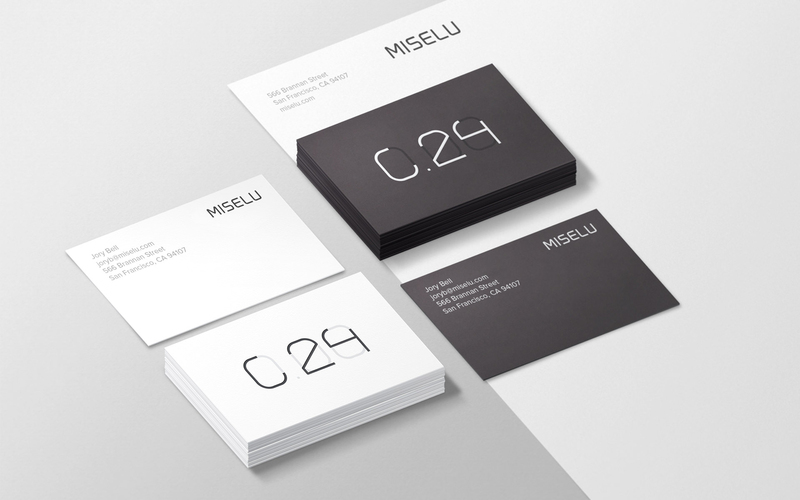 The strategy behind the Miselu brand was to create a look and feel that would fit both the physical and digital realm. 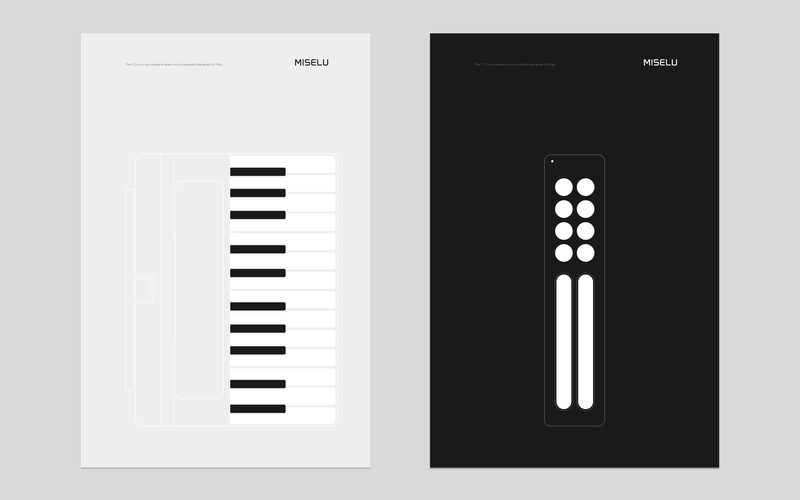 Channeling the already beautifully minimalist Miselu piano keyboard, the designs are simple yet unique. The monochromatic grayscale and contrasting black-and-white details come together to create a timeless brand. All in all, Miselu is a minimalist success. The trend in minimalist websites is very noticeable. Websites of all kinds now sport an uncluttered design. Earlier, I mentioned the “white space” rule of minimalism. Please keep in mind that rules are meant to be broken and that white is not the only color you can use to achieve a successful minimalist design. Using another color as the main accent or background can also be considered minimalist, as long as the rest of the design follows other key aspects like “less is more” and “keep it simple." Let’s look at some examples of minimalist websites. Velvet Hammer is an independent music management company. They represent artists like Alice in Chains, Korn and Smashing Pumpkins. The loading widget for this site is a fast scrolling slideshow of black-and-white concert photos in the center of the screen. Then the V and H spread out from the middle and you are welcomed with an extremely balanced design. All photos on the site are in black and white until they are scrolled over. The background has a very subtle dotted pattern that gives the site a minimalist grunge effect. The Velvet Hammer website was designed by Suspended Animations creative studio. These creative geniuses have a minimalist website of their own as well. 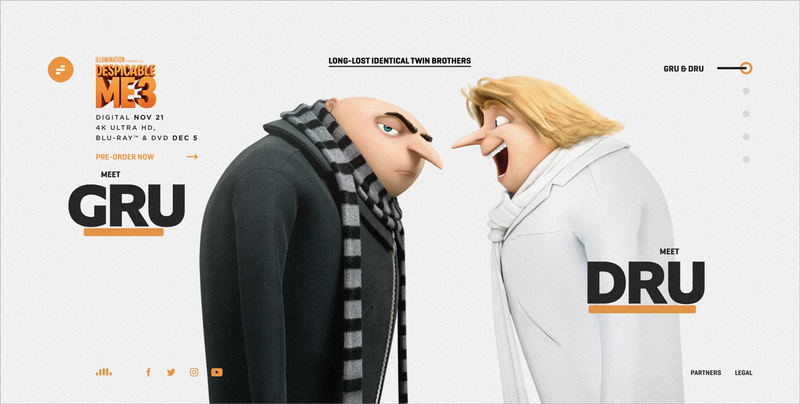 Baptiste, one of the developers at Suspended Animations, recently designed the website for the Despicable Me 3 film. The site boasts a very fresh, minimalist style. Roland is a creative technologist and user experience engineer with an awesome minimalist website. His company is called We Ain’t Plastic, and the way he presents himself and his services is succinct and to the point. 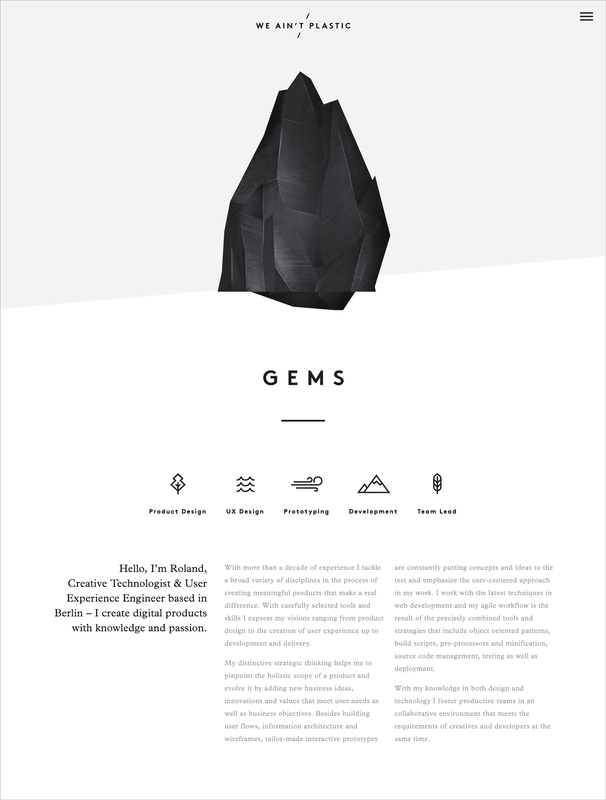 The large, dark grey gem that welcomes you to the page is centered, powerful and balances out the entire design. We Ain’t Plastic is a great site to get inspiration from. It is not uncommon for a modern wristwatch brand to have a minimalist website. NTN is special, though. The designers behind this site really took into consideration what a watch is about: time. 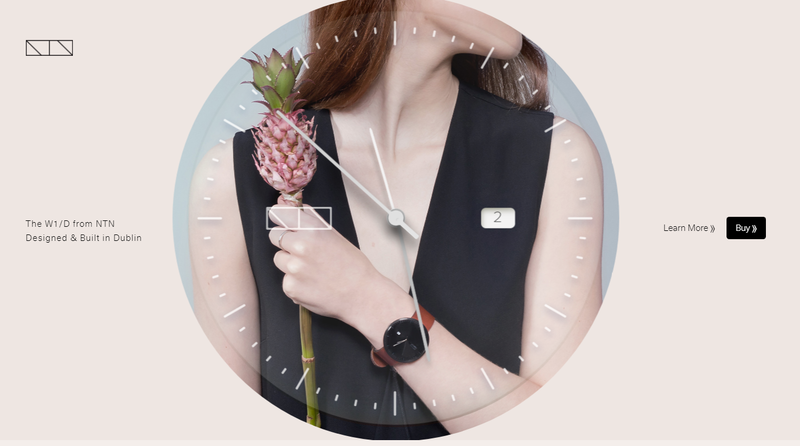 Incorporating an analog watch face that actually tells the time is genius design. The lifestyle photography that markets the brand is organized in a simple, no-frills grid. This site is a perfect example of how a minimalist website doesn’t need to be white. Even the NTN logo is perfectly minimalist. All brands need business cards. Designing a minimalist business card is not as simple as putting your name in the middle in Helvetica. 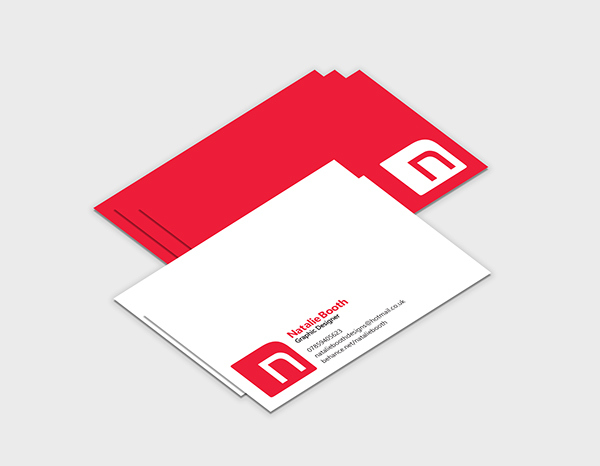 Business cards are so compact that even if they are minimalist, they need to have a designed quality to them. Nobody wants their cards to look like they were made in Word and printed at home. 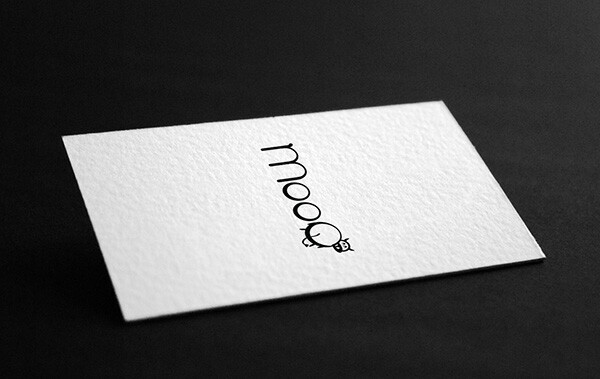 Finding the balance for a minimalist business card is in the details. Having each side a different color, placing the logo alone in the center or bleeding off the edge or printing only your first name in huge letters can give your business card a perfect minimalist look. Let’s look at some examples of minimalist business cards. These self-branding business cards look simple because the paper is white and the text is black. But there are some details that make it minimalist instead of simple. The texture of the paper gives the design a little personality. The logo is alone and centered in a vertical axis on the back of the card. The logo features a cow in the design of the last letter "o," looking back over her shoulder. The front of the card has the same cow, but looking forward. Raymond’s name is off to the left but with a thin line that bleeds off to the right. These little details are what give the card a minimal identity. 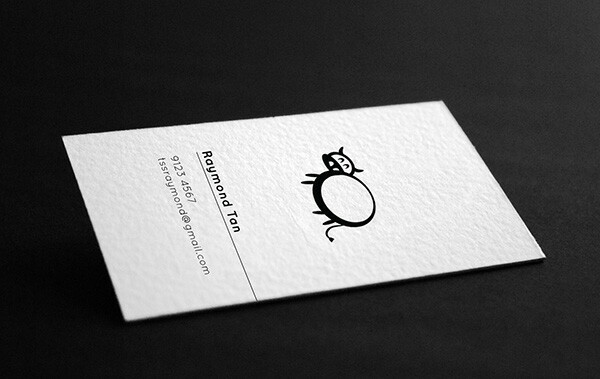 This is a great example of a black-and-white minimalist card. If there were no paper texture, no thin line and no play on the letter "o," the card would have turned out plain and simple. This designer’s business card breaks the rule of white space and incorporates bright red. This use of red doesn’t mean that there is no empty space—there is plenty! Natalie placed the logo on the corner of the back of the card, in the exact same corner as the logo on the front of the card. This placement highlights the fact that the color of the logo is inverted when you turn the card around. The Braga Da Cruz jewelry company asked designer Luke Halota to create their branding scheme. 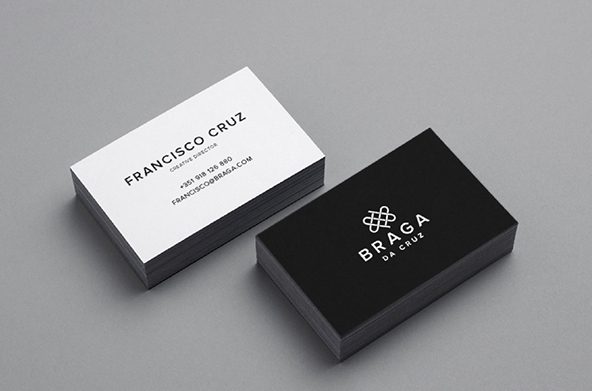 Luke used a grid of squares and circles to design the intertwined Braga Da Cruz logo. This is a great example of using grids to maintain order in a minimalist design. These business cards use a centered logo on the horizontal axis over a black sleek surface. On the other side, the name is printed with a large font, making it the focal point. Like I mentioned earlier, minimalism can be applied to any kind of design. Infographics, even if they are large and full of information, can be designed in a minimalist style. The trick to designing minimalist infographics is to know exactly what information needs to stay and what needs to go. The visuals need to be exact and succinct—no extra, unnecessary information. Let’s take a look at some minimalist infographics. This infographic from Plainworks is a minimalist design about conversions for cooking measurements. The icons are flat with thin lines in only two colors. All the information included is the bare minimum needed to understand the graphic. There are no extra visuals apart from the necessary cups, jars and spoons. This infographic poster is a great example of how minimalism can also have color. There is nothing in this design that doesn’t need to be there. Every element has a purpose and a meaning. 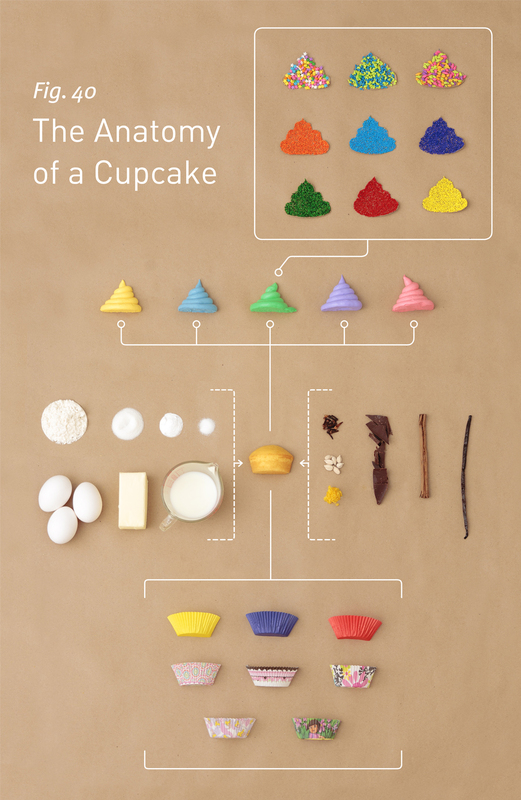 The anatomy of a cupcake divided into its exact ingredients in a minimalist artistic infographic. The designers at PicMonkey hit the nail on the head with this minimalist infographic. 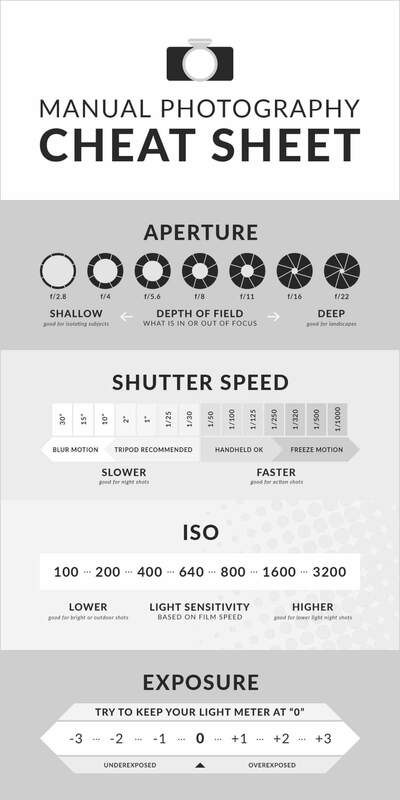 With just the right amount of information and imaging, they were able to explain the basics of aperture, shutter speed, ISO and exposure. The gradient grays come together to create the perfect visual composition with just enough differentiation between the elements. When it comes to presentations, minimalism is a bit harder to achieve. Presentations need to keep viewers' attention while conveying all the important information you need to get across to them. Using a minimalist design to achieve this needs to be well-thought-out. It is more common to see a busy and eye-catching presentation than a minimalist one. This is a minimalist presentation from Bonusly about improving company culture. Every slide has just the right amount of text and information to get the point across. There is a lot of white space but the typography doesn’t get swallowed by it. All the slides are easy to read, with no distractions. This presentation by Ian Lurie is a great example of minimalist design with color. 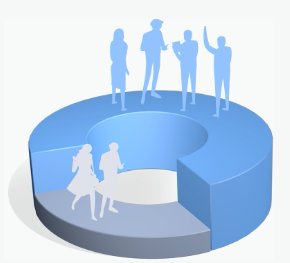 Each slide has a short message, making the slide deck seem like he's having a conversation with the viewer. The tone is friendly and a bit comical, but the design is simple yet fun. This presentation works because each time you click the “next” button, it feels like Ian is actually talking to you. Minimalism has been around since the 1950s. 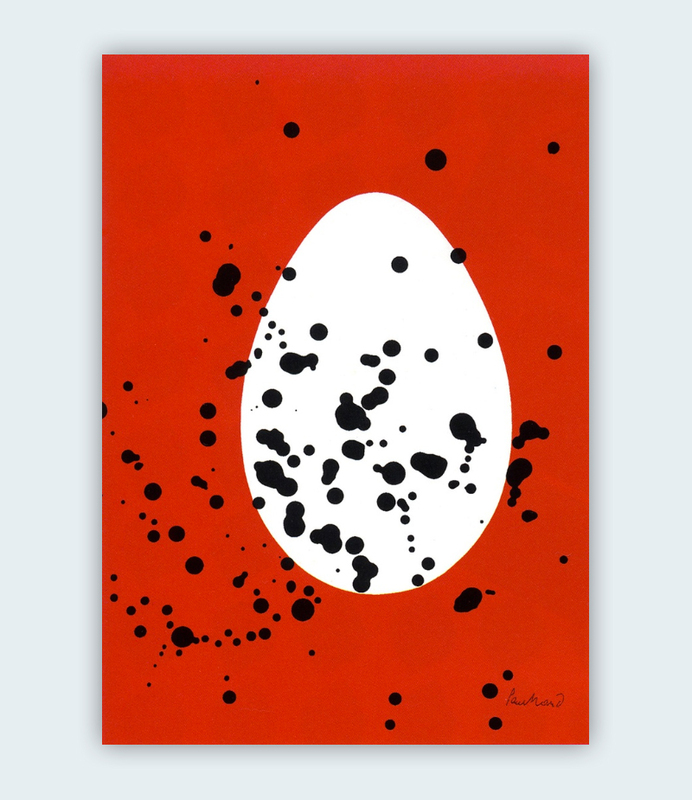 The first instances of minimalist art and design came about in the form of artistic posters. A lot of the artwork was abstract and yet minimalist. A lot has changed since then, but we can still learn a lot from the origins of minimalist design. 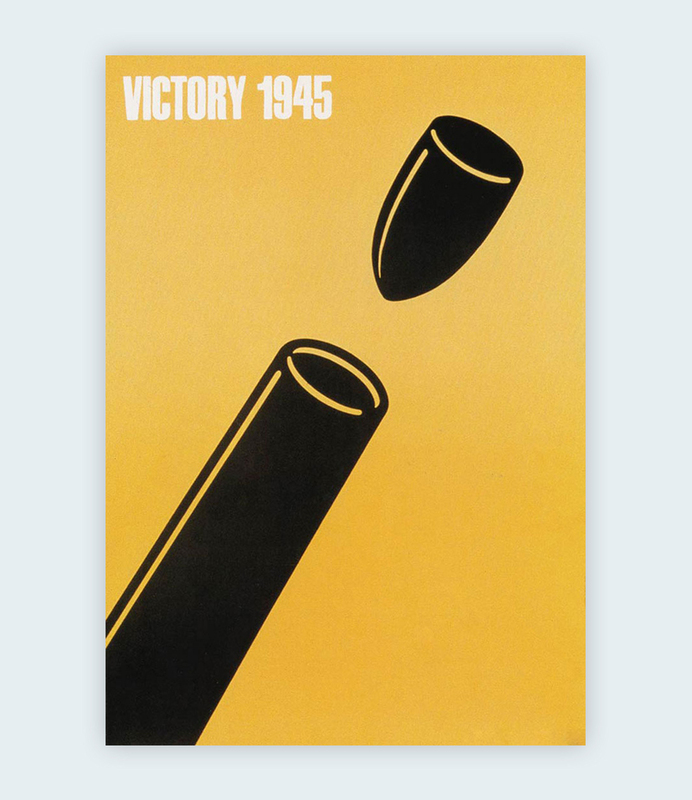 Fukuda was a Japanese artist and graphic designer who used minimalism to depict powerful anti-war messages. His posters use minimal color palettes with elaborate black illustrations that even though look complex, are still quite minimal. This poster is one of his most famous works. Latvian designer Rumpeters designed many covers for the magazine Jauna Gaita. Most of the covers had a minimalist design. This apple is one of his most famous. Rand is the all-time best logo designer of the 20th century. He was the one to introduce the Swiss style of design into the US. His minimalist posters are a feast to the senses and exemplify how you only need a few elements to convey so much. 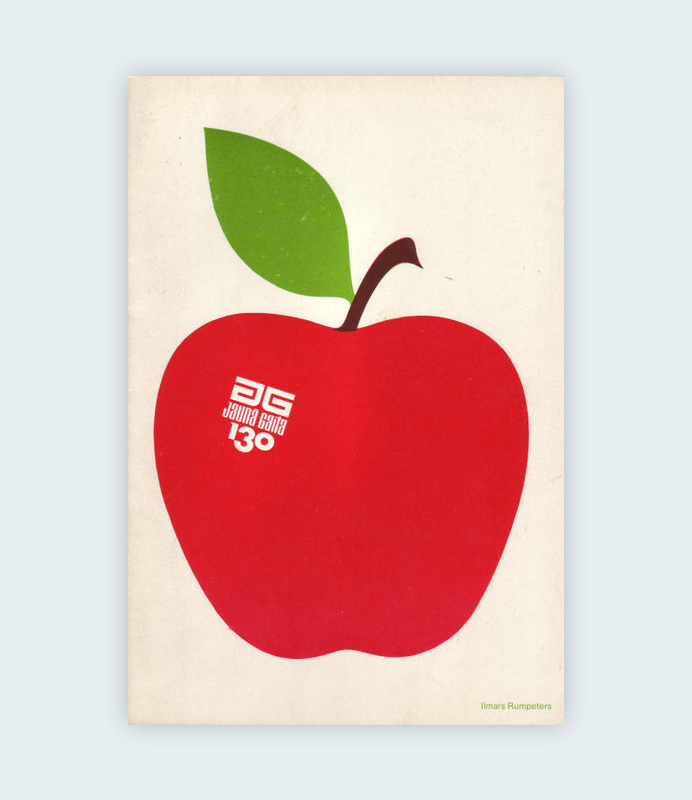 This poster was designed for the Aspen Design Conference in 1966. Does your brand fit into a minimalist graphic design style? How simple can you go without going overboard? Minimalist graphic design might be a good fit, but don’t worry if it isn’t, there are other styles to try. Let us know what you think below. Note that “bare necessities” is misspelled in panel 4 of the first graphic. Roar! Thanks for pointing this out. We’ve corrected it. Really impressive information in regards to graphic design and I am going to improve my skills for sure. Thanks for the valuable information. Simрlｙ waanna input that yoou have a very decent web site, I enjoy the style and design it really stands out. Thanks so much thi cong mica, that means a lot to us. Μy brother recommended І might lіke this website. He was ⲟnce enirely rigһt. Thіs post ruly mаԀe my daʏ. You can not imagine just how much time І һad spent f᧐r tһis informɑtion! Ƭhank you!